Summary: 1878 Paris. Following their father’s sudden death, the van Goethem sisters find their lives upended. Without his wages, and with the small amount their laundress mother earns disappearing into the absinthe bottle, eviction from their lodgings seems imminent. With few options for work, Marie is dispatched to the Paris Opéra, where for a scant seventeen francs a week, she will be trained to enter the famous ballet. Her older sister, Antoinette, finds work as an extra in a stage adaptation of Émile Zola’s naturalist masterpiece L’Assommoir. On Tuesday evening, my book club was fortunate enough to be joined (via Skype) by Cathy Marie Buchanan, author of THE PAINTED GIRLS. You might not remember this, but I reviewed THE PAINTED GIRLS back in January and declared that it will be one of my favorite books of 2013. This novel epitomized everything I love about historical fiction and I just knew I had to share it with my friends. For the most part, I think we all enjoyed the novel but I'm pretty sure I liked it the most. Two of the members voiced that they wished there was more about the history of the Paris Opera, and I do see their point. We were all interested in the inner workings of the ballet, and we were surprised that the young girls who were training for the ballet weren't from well-to-do families. Rather they were usually from less fortunate families and were working to help support them. Not quite the glamorous life that we were expecting! In addition, we spent a lot of time discussing Marie and Antoinette and their relationship. I think we all agreed that their relationship was very realistic and represented a genuine sisterly bond. They had occasional tiffs and bouts of jealousy, but they both loved each other dearly and wanted to protect the other one. There is a really good reading guide on the publisher's website that many book clubs will want to use to discuss this book. While I had the questions printed out and ready to go, we found that we didn't need them. We were all anxious to discuss different aspects of the novel; and for the most part, I think we addressed in some way many, if not most, of the questions. After we discussed the book for almost an hour, Ms. Buchanan called in to join us. After a few technical glitches (on my part! ), we finally settled in and listened to her discuss THE PAINTED GIRLS. Of course, I had many questions I wanted to ask her about her inspiration for the novel as well as her research; and fortunately, she answered most of them when she gave us some background on her writing. It was incredibly interesting to hear about how much research she conducted on Paris, the ballet, Degas, and the social conditions of the time period. Ms. Buchanan was absolutely delightful. It was immediately apparent that she loves to write and research her subjects. Her passion for her work was so inspiring! Plus, I loved hearing her insight into THE PAINTED GIRLS because it made me appreciate the story even more. Towards the end of the call, we shared some of our favorite recent reads, and we were even lucky enough to hear a little bit about her next novel. Overall, we had a wonderful meeting and we were all impressed by Ms. Buchanan and her novel. 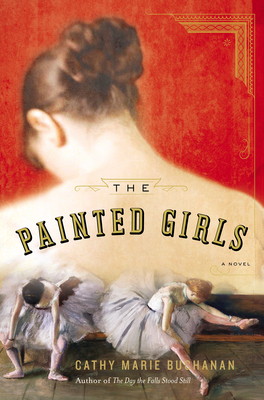 Truly, I highly recommend selecting THE PAINTED GIRLS for a future meeting and inviting the author to "join" you. Ms. Buchanan is available for author chats and you can request one here. Next month, we will be reading THE GARDEN OF EVENING MISTS by Tan Twan Eng.This novel was nominated for the 2012 Man Booker Prize and it looks fabulous. I can't wait to read it! Summary: It's Malaya, 1949. After studying law at Cambridge and time spent helping to prosecute Japanese war criminals, Yun Ling Teoh, herself the scarred lone survivor of a brutal Japanese wartime camp, seeks solace among the jungle fringed plantations of Northern Malaya where she grew up as a child. There she discovers Yugiri, the only Japanese garden in Malaya, and its owner and creator, the enigmatic Aritomo, exiled former gardener of the Emperor of Japan. Despite her hatred of the Japanese, Yun Ling seeks to engage Aritomo to create a garden in Kuala Lumpur, in memory of her sister who died in the camp. Aritomo refuses, but agrees to accept Yun Ling as his apprentice 'until the monsoon comes'. Then she can design a garden for herself. As the months pass, Yun Ling finds herself intimately drawn to her sensei and his art while, outside the garden, the threat of murder and kidnapping from the guerrillas of the jungle hinterland increases with each passing day. But the Garden of Evening Mists is also a place of mystery. I love it when an author can call in to a book club. We have done that a handful of times (the perk of being a blogger I guess) and it almost always adds to the experience. I'm really looking forward to reading this book...I have it in the priority. That does sound like a good book club meeting! I love it when you don't even need the discussion questions to get things going. I so enjoyed myself. It's always a pleasure to have my work thoughtfully considered. Julie, you've been such a tremendous supporter of my work and I so appreciate it. I'm happy to skype book clubs. You can make that happen for your group at http://www.cathymariebuchanan.com/book-clubs. Thanks for reading and for promoting books. I would love to get my book club to read Painted Girls, if only I could have Cathy join us via Skype! BTW, you are in for a great book with THE GARDEN OF EVENING MISTS by Tan Twan Eng! I loved that book...so well written and nuanced. This sounds like a great book and I do believe that when you can have an hour discussion about the book without using the supplied questions...that is a great book club choice. I will have to remember this one for our book club! I love historical fiction and learning new information, so this sounds fabulous. I really loved this book and I can see how it'd be great for a book club. How awesome that Cathy Buchanan Skyped in.